In engineering, it’s what you don’t know you don’t know that can ruin your day and keep you awake at nights. Especially after you get your prototypes in the lab, or worse, field returns from the customer. This is one reason why I have been going to DesignCon for the last few years, and this year has been no exception. One of the sessions I attended was the Power Integrity Boot Camp, hosted by Heidi Barnes, from Keysight Technologies, and Steve Sandler from Picotest. What I didn’t know I didn’t know from this boot camp was how important it was to match the voltage regulator module (VRM) output impedance to the power distribution network (PDN) input impedance. Steve and Heidi recently presented a webcast which was a condensed version of the DesignCon Bootcamp session. If you are involved in PDN design, this webcast will provide you with an introduction to power integrity and give some insight into the latest tips and techniques to achieve flat impedance designs. Of course, I always try and attend some of Eric Bogatin’s presentations because I always come away with something I didn’t know I didn’t know. Eric is an Adjunct Professor at the University of Colorado and the Dean of Teledyne LeCroy’s SI Academy. He was honored at this year’s DesignCon with a well-deserved Engineer of the Year Award. The speed training event, he hosted along with Larry Smith from Qualcomm, was on the top of my list to attend. 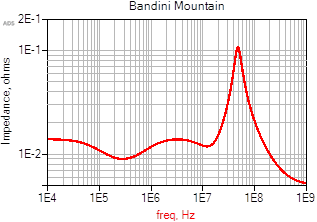 During the session, Eric described the most critical feature of PDN design was controlling the “Bandini Mountain”. The Bandini Mountain expression has often been used to describe a tall pile of manure. Originally it referred to a 100 foot tall mound of fertilizer built by the Bandini Fertilizer Company in California prior to the 1984 Los Angeles summer Olympics for advertisement purposes. When the company went bankrupt, this large mound of smelly fertilizer was left behind and everyone wished it would go away. Because of this little bit of trivia, it was the term coined by the late Steve Weir to describe the large resonant frequency peak formed by the parallel combination of the on die capacitance and the package lead inductance, as seen from the die looking into the PDN. This peak is inherent in all PDN networks, and almost impossible to get rid of. And like the Bandini Mountain, it was something PDN designers wish could go away. Steve used to be a regular Icon at past DesignCons until his sudden passing in August 2015. Steve was one of the smartest guys I knew, and I always looked forward to catching up with him when I visited DesignCon. If you knew Steve, like many of us did, you know that he often had very humorous analogies to describe empirical or simulated results. This example is no exception. He will be sorely missed for his contribution the engineering community. What I learned I didn’t know I didn’t know from Eric’s and Larry’s presentation was that every PDN design will have a “Bandini Mountain”, and unless you know what frequency it is at, and take steps to try and mitigate its peak, it could ruin your day! Even though the system seems to “work” in the lab, it doesn’t mean it’s robust enough and won’t fail under certain operating conditions in the field that affect the transient currents. Eric has made available the speed training slides and the associated video off his SI Academy web site. If you look under Video Recordings, Presentations and Webinars (VRPW) and scroll down to the bottom you will find the slides titled, “VRPW-60-35 DesignCon 2016 PDN speed training”. If you watch the whole presentation you will learn all about the “PDN Bandini Mountain” and techniques to mitigate its effects. And while you are there, have a look at the many other videos and presentations available for free and by paid subscription. Eric and Larry have also co-authored a new book, scheduled for release in June 2016 titled, “Principles of Power Integrity for PDN Design”. I can’t wait to buy this book to add to my library so that I can find out more of what I don’t know I don’t know about PDN design. If it’s anything like Eric’s other books, I won’t be disappointed.